Out of all the research I have done during my time as an assistant professor, I get more questions from journalists and policymakers about my research on student fees than any other study. In this study (published in the Review of Higher Education in 2016), I showed trends in student fees at public four-year institutions and also examined the institutional-level and state-level factors associated with higher levels of fees. Yet due to the time it takes to write a paper and eventually get it published, the newest data on fees in the paper came from the 2012-13 academic year. 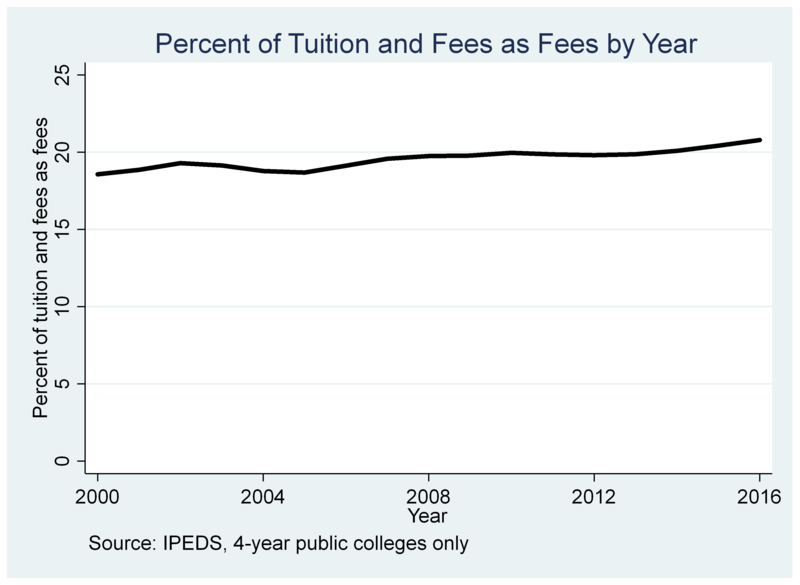 In this blog post, I update the data on trends in fees at public universities for in-state students to go through the 2016-17 academic year. It’s quite a bit harder than it appears to show trends in student fees because of the presence of fee rollbacks—colleges resetting their fees to a lower level and increasing tuition to compensate. Between the 2000-01 and 2016-17 academic years, 89 public universities reset their fees at least once (as measured by decreasing fees by at least $500 and increasing tuition by a larger amount). This includes most public universities in California, Massachusetts, Minnesota, and South Dakota, as well as a smattering of institutions in other states. Universities that reset their fees had a 115.3% increase in inflation-adjusted tuition and fees since 2000-01 (from $4,286 to $9,228), compared to an 83.7% increase for the 441 universities that did not reset their fees (from $4,936 to $9,068). With the caveat that I can’t break down consistent increases in tuition and fees for some of the colleges with the largest price increases, I present trends in tuition and fees for the other 441 institutions below. The first figure shows average tuition (dashed) and fees (solid) levels for each year through 2000-01 through 2016-17. During this period, tuition increased from $3,999 to $7,183 in inflation-adjusted dollars (a 79.6% increase). Fees went up even faster, with a 106.7% increase from $912 to $1,885. The second figure shows student fees as a percentage of overall tuition and fees. This percentage increased from 18.6% in 2000-01 to 20.8% in 2016-17. 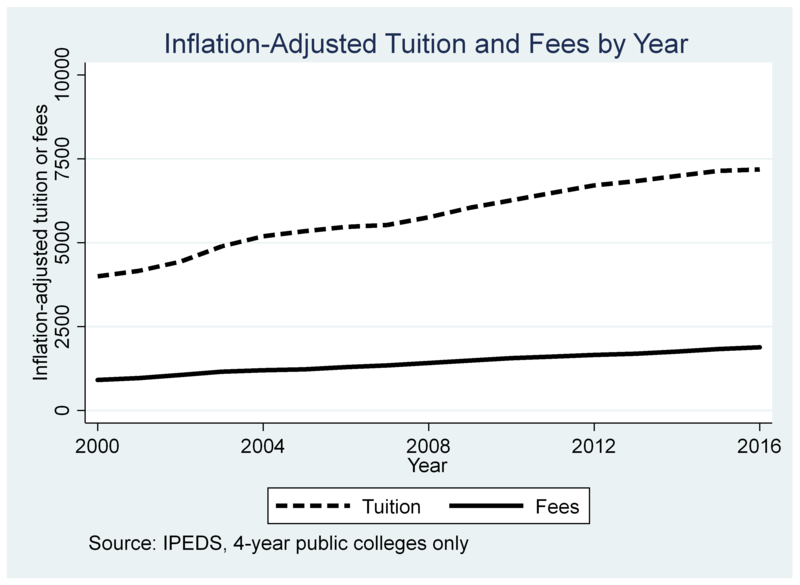 This increase in fees is particularly important in conversations about free public college. Many of the policy proposals for free public higher education (such as the Excelsior Scholarship in New York) only cover tuition—and thus give states an incentive to encourage colleges to increase their fees while holding the line on tuition. It’s also unclear whether students and their families look at fees in the college search process in the same way they look at tuition, meaning that growing fee levels could surprise students when the first bills come due. More research needs to be done on how students and their families perceive fees.